OK, here’s a dilemma, three young girls aged between 11 and 14, (one of the girls has never been anywhere near Dartmoor), my wife and myself want to go for a walk on Dartmoor. The girls want to go somewhere that they can see lots of ponies, see some Moor Otters and hopefully get some letterboxes. I want to go where I can take some decent photos and find some possible subjects for pages on this website, the wife doesn’t mind as long as its in the fresh air with some nice views. As it has been many years since I was last up around the Cox, Roos, and Staple Tors this seemed a fairly good option that would satisfy everyone??? What a difference a day makes, after yesterday’s foul weather we awoke to glorious azure blue skies with a gentle breeze wafting around the cottage. So with a spring in our steps we headed off to our starting place at Pork Hill car park. Apart from the awe inspiring views from the tors I wanted to find two boundstones; the Black/Flat Rock and the Picket Stone, sad I know but there you go. I reckon we had not gone more than half a mile from the car park when we came across the first herd of wild ponies, one tick off the list. After about twenty minutes of cooing and clucking we finally manged to drag the girls away from their equine encounter of the boring kind – bloody pony peekers. A little further on near Beckamoor Head a large flat rock lay just beside the old Wedlake track and yes there were the letters ‘W’ and hardly discernible ‘P’ carved into it – another tick off the list. The Black Rock AKA Flat Rock marks the boundary between the parishes of Peter Tavy (P) and Whitchurch (W). It’s pretty clear why the pancake shaped boundary marker should be called Flat Rock but black it certainly is not. The next port of call was the large pond which sits between Cox Tor and Great Staple Tor and just above the headwaters of Beckamoor Water in an area called Beckamoor Dip. On this occasion the pond seemed to be alive due to the breeze gently rippling its waters which changed from blue to grey as the clouds passed overhead. Just west of the pond the old ‘Quarryman’s Path’ or ‘Sheep’s Path’ as it’s sometimes called runs down to Merrivale Quarry. This was the route taken by the Peter Tavy quarrymen going to and from work at Merrivale and in parts sections of the old paving can still be seen. From the pond we headed up towards Roos Tor in search of the Picket Rock, AKA Picke Rock, again another natural boundary point with the letters ‘P’ and ‘W’ carved into it. Various authors have suggested that the name derives from the old word for pointed – piked, there is another boundstone on the Cator Manor bounds called the Piked Stone which is well and truly pointed, however as can be seen below this rock is far from being pointed? I just wonder if the name has anything to do with a military picket as at one time the area was used for military training? Either way all my ticks ticked. From Picket Rock we ascended onto Roos Tor where several natural features can be seen along with a host of boundstones encircling the tor. On the summit of the tor is an example of a logan stone and several rock basins as can be seen below. A common belief of the early antiquarians was that logan stones and rock basins were the work of the Druids who used them in their various rituals and rites. In 1826 Eliza Bray wrote the following about Roos Tor; “But a mass of rocks, near the latter, afforded us a very curious specimen of the works of the druids.” Although today such notions are preposterous it’s not hard to see how such beliefs came about. On this occasion the wind was gently blowing across the water in the basin and with the sunlight gave a it a surreal shimmering effect. It was as if the very waters were alive, a truly magical effect. Talking of Druids whilst we were on the tor a party of walkers appeared and gathered around the logan stone. Now I’m not sure if they were some new-age pagans or a guided walk group but as can be seen from the photograph below some weird goings-on took place. Was the poor unfortunate woman lying under the logan stone a human sacrifice in some archaic ritual to please the Gods and was awaiting to be crushed to death? Or, had she caused a few problems on the walk and this was the guide’s punishment for her crimes? Either-way it was an odd performance to watch. There can be no question that Roos Tor had suffered badly at the hands of the stone cutters so much so that in the mid 1800s the Duke of Bedford erected a series of protective markers stones around the tor inside which stone was not to be taken. There were fourteen in number each consisting of a bisected circle which were carved into natural rocks as can be seen below. It has been suggested that the original markers were put in place about 1847 and were then replaced around 1890 with a series of more substantial stones like the one pictured above. Each stone being of dressed granite standing about one metre high with the letter ‘B’ on the side facing away from the summit, as can be seen above. Having taken lunch it was time to move over to Great Staple Tor whose name derives from the old Saxon word – Stipel, meaning steeple or Tower. It does not take much imagination to see why, its two main ‘tower-like’ stacks almost look as if they are about to topple over at any moment. Again this was a tor that had suffered greatly from the attentions of the old stone cutters but it did give the girls a chance for some rock climbing. I must admit there were some heart-stopping moments as they clambered up the stacks, accidents just waiting to happen or maybe I’m too over protective? They also found a couple of letterboxes which was another off their tick list, add to this the fact that they could see the ice-cream van in Pork Hill car park and an extraordinary herd of ponies near to it and it soon became time to head back. On returning to the car I noticed that despite the car park being full our rented vehicle sat leper-like with spaces on either side. Was this because of the torn off door trim which was accidentally ‘hurt’ the day before and nobody wanted to be accused of the damage (which was going to cost me £100)? All in all virtually all our ticks had been accomplished except to find some of the otter statues on the Dartmoor Otter Trail. From the few that I had already seen the best one was that located at the Postbridge Visitor’s Centre so that was to be the next destination. That was after we had finally dragged the girls kicking and screaming from the equine encounters of the enormous size, oh, and the ice-creams. Sadly on arriving at Postbridge the car park was full to brimming and so that idea was soon abandoned and we headed off back to Princetown. The girls saw the three otters at the visitor’s centre and partook in the obligatory dressing up in convict garb and Sherlock Holmes outfit – hallelujah, all ticks ticked. As there was also another of the Moor Otters in the Fox Tor Cafe we headed off over there for a coffee and more importantly three Cokes. I must say there home-cooked ham sandwich was a delight, thick, lean ham in brown bread and mustard. Having returned to the cottage, all sporting health red wind burn it was a quick shower and off to the Bearslake Inn for dinner. Another ancient inn but a complete contrast to the mysterious Highwayman Inn of the previous night. The earliest part of this Grade II listed building is said to date back to the 13th century when it was a ‘Dartmoor Longhouse‘ belonging to a farm or small holding. 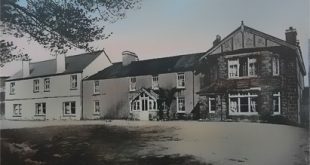 In 1959 the building became a tearoom catering for the growing number of visitors passing by and later took on the roll of an inn. Once again we had an excellent meal, this time in the restaurant. So all in all a good day with a short walk in glorious sunshine and every desire fulfilled, all that remained was to return the damaged car and cough up the £100 insurance excess.